This data has been typically reported online by the state with the release of School Performance Profiles (SPP) for each school. Schools would receive a number on a scale of 0 to 100, and the number was calculated based on a variety of factors such as the ones listed above. This year, Pennsylvania has moved to the Future Ready PA Index, which is meant to be a more holistic approach to measuring school performance. The Future Ready PA Index includes the measures of academic proficiency and growth, along with some new measures such as career readiness and chronic absenteeism. 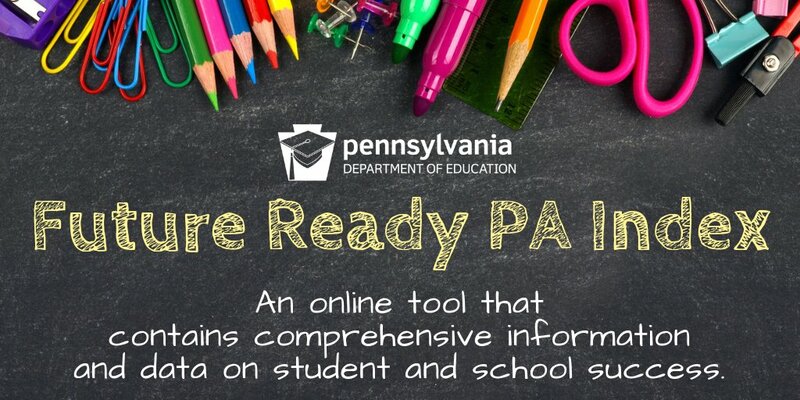 For additional information, please take a few moments to watch the informational video and review the PDF files posted below from the Pennsylvania Department of Education (PDE) . This year, in addition to the measures of school performance reported by the Future Ready PA Index, we are proud to share a video series showcasing "Stories of Student Success." The videos tell OUR story through student interviews and data analysis. What better way to measure the growth and success of our students than to talk to them about their experiences. Click here to view. Schools are evaluated in these three areas, and receive an overall score for each. The score is illustrated with a blue, green, or red dot. Blue indicates a school has met or exceeded standards or goals for the category, green indicates a school has met or exceeded the interim target, and red indicates a school has not met the standard or interim target.